Tampa Bay made it three straight wins with a dominating 27-7 dispatching of the former AFC Champion New England Patriots in a game that sold out prior to the season opener. In a game that was highlighted by a special performance by the Buccaneer defense, the Patriots’ vaunted high-powered offensive attack was grounded, managing under 100 total yards until a 75-yard drive in the game’s final two minutes. 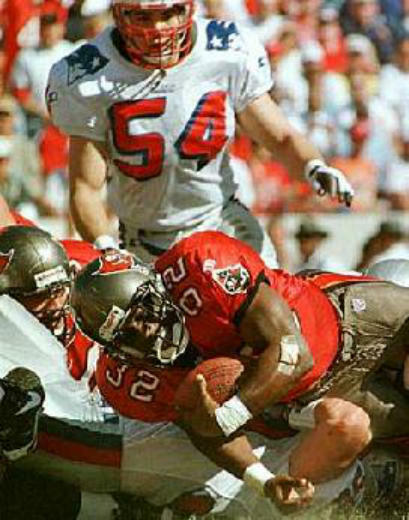 INDIVIDUAL STATISTICS RUSHING BUCS: Alstott 16-91, Dunn 14-36, Rhett 8-15, Williams 1-5, Walsh 2- (-1). PATRIOTS: Cullors 4-41, Martin 8-26, Byars 2-5, Gash 1-4, Bledsoe 1-(-1). 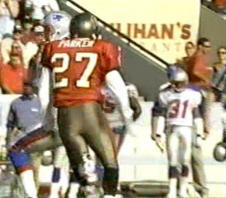 PASSING BUCS: Dilfer 29-21-209-0-1. PATRIOTS: Bledsoe 25-13-117-2-0, Zolak 6-3-34-0-1. RECEIVING BUCS: Dunn 4-20, Harris 3-51, Williams 3-36, Alstott 3-35, Anthony 3-24, Copeland 3-20, Moore 2-23. PATRIOTS: Brown 5-58, Martin 4-23, Coates 3-27, Jefferson 2-28, Jells 1-9, Purnell 1-6. INTERCEPTIONS BUCS: Brooks 1-13, Abraham 1-0. PATRIOTS: none. 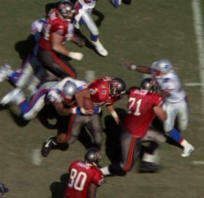 KICK RETURNS BUCS: Dunn 1-10. PATRIOTS: Meggett 3-77, Cullors 1-9. PUNT RETURNS BUCS: Williams 3-37. PATRIOTS: Meggett 1-5. 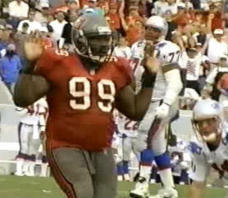 SACKS BUCS: Jackson 1-17, Upshaw 1-13, Sapp 1-11, Culpepper 1-10, Parker 1-7. PATRIOTS: Canty 1-7.